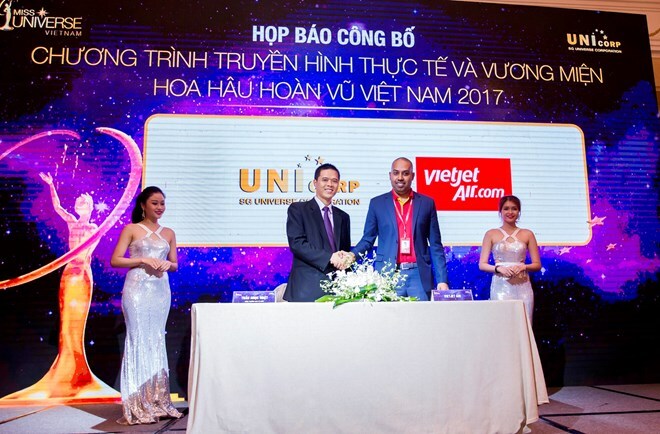 Hanoi (VNA) – Low-cost airline Vietjet is the official transportation sponsor for the Miss Universe Vietnam Contest 2017, accompanying the event for the second consecutive year. Accordingly, all contestants as well as organizers of the beauty contest will fly with Vietjet. The airline will present the winner of Miss Universe Vietnam 2017 one year of free flights on all domestic and international routes operated by Vietjet and also be invited to be Vietjet’s special guest for all the airline’s on-board activities. Miss Universe Vietnam is a prestigious contest with the international copy right of Miss Universe Organization, which aims at honoring charm, confidence, bravery and intelligence of Vietnamese women in the new era. The winner of this year contest will represent Vietnam to participate in Miss Universe – one of the most prestigious, famous and attractive beauty pageants in the world. Apart from bringing flight opportunities for millions of Vietnamese people with reasonable and affordable air fares, Vietjet always accompanies social community, cultural and sporty activities of great significance such as Hot air balloon festival, the music night to commemorate Trinh Cong Son musician, IRONMAN 70.3 Vietnam, Miss Universe Vietnam, Miss Vietnam, The Face Vietnam, National University Entrance Exam Support Campaign, Da Lat flower festival, etc... Vietjet continuously brings many promotional programmes as well as accompanies meaningful activities with a lot of benefits to passengers and people. Established in 2007, Vietjet is now leading the domestic aviation market in Vietnam and actively expanding its international flight network. After five years of operations, the airline has flown nearly 40 million passengers, and been awarded 32 domestic and nine international accolades, including being named one of the Top 500 Brands in Asia 2016, “Vietnam’s Most Favorite Airline”, “The Best Asian Low Cost Carrier 2015” at the TTG Travel Awards 2015. Vietjet is a member of the International Air Transport Association (IATA) with the IATA Operational Safety Audit (IOSA) certificate. The airline’s operation safety and technical reliability rates have always been among the highest in Asia Pacific region with a modern and well-furbished fleet and amazing diverse and friendly services.